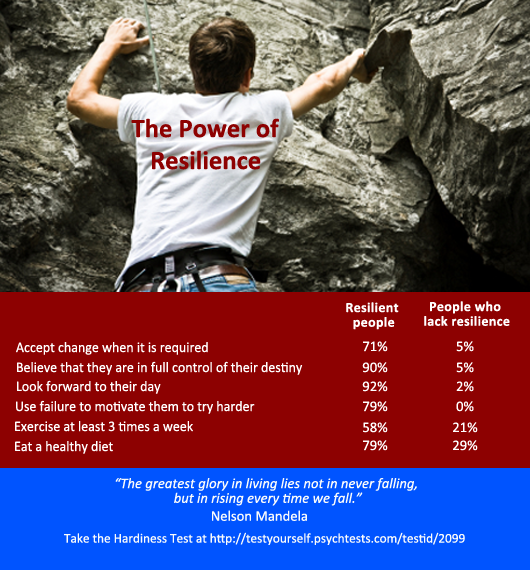 Research by PsychTests.com indicates that resilient people approach stress, challenge, and life in a way that boosts their wellbeing. Resilient people face life with eyes wide open. They confront challenges and problems head-on, and refuse to admit defeat. Resilient people still go through moments when they feel like giving up, or when they don’t see any possible solution to their problem – but they keep plodding on. So what makes some people so resilient in the face of seemingly insurmountable challenges? Research conducted at PsychTests using the Hardiness Test reveals that resilient people take a unique approach toward life that can be summed up in three words: Commitment, Control, and Challenge. Resilient, hardy, or mentally tough people view and approach their world in a unique way. A study conducted by the researchers at PsychTests reveals that these “tough cookies” do more than survive – they thrive. And the secret to their survival is a simple formula: Commit + Control + Challenge = Success. 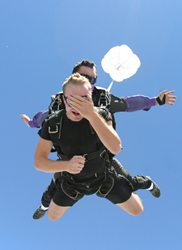 Resilient individuals commit themselves to every activity they take on, no matter how trivial. They take responsibility for their actions and their life (i.e. they have an internal locus of control). Finally, they view a stressful situation as a challenge to overcome, rather than as a permanent setback or obstacle. 71% accept change when it is required (compared to 5% of people who are not hardy). 83% can find something enjoyable in even the most mundane tasks (compared to 2% of people who are not hardy). 98% are actively involved in hobbies or other leisure activities (compared to 19% of people who are not hardy). 90% believe that they are in full control of their destiny (compared to 5% of people who are not hardy). 92% look forward to their day (compared to 2% of people who are not hardy). 95% find ways to “spice up” everyday tasks (e.g. listening to music while cleaning; rewarding themselves after getting all the cleaning done, etc. ), compared to 2% of people who are not hardy. When they fail at something, 79% use it as motivation to try harder next time (compared to 0% of people who are not hardy). In the last year, 11% of hardy people in the PsychTests’ study took more than 3 sick days last year. Of the people who are not hardy, 28% took more than 3 sick days. 58% of hardy people exercise 3 or more times per week, compared to 21% of people who are not hardy. 79% of hardy people eat a healthy diet, compared to 29% of people who are not hardy. Take pleasure in the small victories. Even the hardest occupations have moments when you can stop and savor a job well done, a person helped, or a difficult task accomplished. By stopping for a moment to reflect on your accomplishment, you can begin to feel less overwhelmed and more satisfied with the work that you are doing. Accept that you’re going to have bad days. Even people who are naturally positive, upbeat, and love what they are doing in life have a day where it seems like everything that could possibly go wrong does go awry. However, those bad days here and there don't stop them from appreciating the overall positives in their lives. If you tend to become pessimistic after a bad stretch, fight against the tendency by reminding yourself of the good things. And if a situation or issue is really becoming a thorn in your side, try taking the long view. Think about how you will feel about the situation in ten years. Either you will think nothing of it, or you will regret not doing anything. Regardless, you will gain motivation to move on with your life, either working to overcome the setback or to move on. Take a step back when a challenge overwhelms you. Getting out of the situation for just a little bit will help you relax and put things in perspective. Try breathing techniques, meditation, or simply changing to a different task to get your mind off of the difficult undertaking. Sometimes, when a molehill looks like a mountain all it takes to regain perspective is to talk it over with a friend who can offer objective insight and help you outline steps for the future. Know the benefits of having an internal locus of control. Although taking responsibility for your actions may sometimes cause you to feel disappointed in yourself (e.g. accepting blame for a failure), it also leads to greater self-motivation and a more active attitude towards life. People who feel that they have control over the outcome of their actions are more likely to take ownership of their behavior and exert a concentrated effort to learn, improve, and grow. Eliminate "cognitive shortcuts.” These are automatic, habitual, deeply-ingrained and self-defeating ways of thinking, and often consist of some variation of the following: “I’ll never be able to do this because I’m too old/poor/weak/scared/uneducated/ugly/fat etc. These negative thoughts are surefire success-killers because they lead to self-fulfilling prophecies. Stop these shortcuts in their tracks. Dig deeper to determine why you feel this way about yourself. Is this something you were told growing up? Do you have proof that this thought is true? Are there examples of moments in your life when this was NOT true? What would be a better, healthier way of viewing this situation – and yourself? Resilient people embrace life’s ups and downs. When trouble rains down on them, they face it with grit and guts.Resilient people commit themselves to every task, believe that they control their destiny, and view a stressful situation as simply a challenge to overcome.